This custom matched pair of Performance Hybrid Nylon Whips with two-tone thongs was made for Todd in Black and Neon Green. The timing fortunately worked out perfectly so that we were able to deliver these whips to Todd in person at Fort MacArthur during last weekend’s 9th Annual Indy Gear Summit. 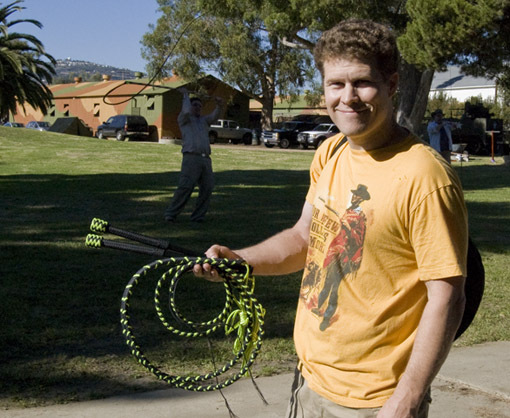 This photo is of Todd himself holding his brand new whips. This entry was posted on Wednesday, November 17th, 2010 at 3:12 pm	and tagged with Black, NeonGreen and posted in Nylon Whips, PH Custom, Whips. You can follow any responses to this entry through the RSS 2.0 feed.